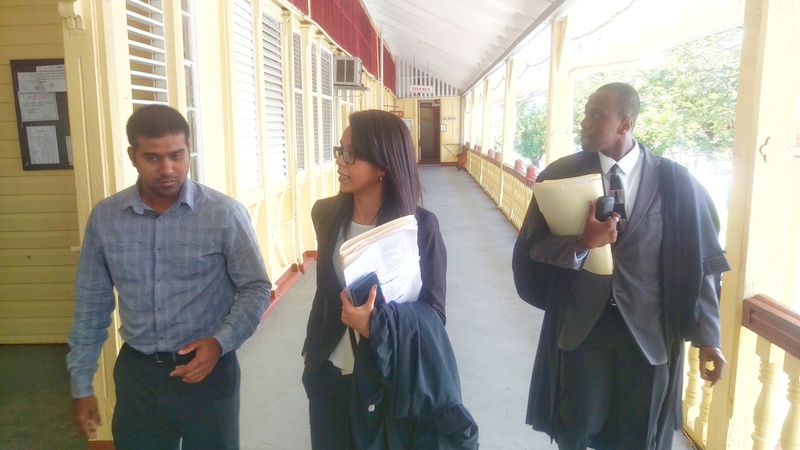 NBS lawyer, Pauline Chase (center), and lawyer for the Town Clerk, Roger Yearwood (far right). Legal proceedings brought by New Building Society (NBS) against Communities Minister, Ronald Bulkan, and Georgetown Town Clerk, Royston King, commenced this morning in the courtroom of Justice Brassington Reynolds, where both parties were given until March 6 to file and serve affidavits in response to the order. Neither Bulkan nor King were present in Court. The initial order, made by Justice Reynolds, was for the Communities Minister to defend his approval of the parking meter by-laws, and further, prove why those by-laws should not be quashed. Justice Reynolds informed the parties that after those Affidavits of Response have been submitted, a decision could be made on the way forward as to arguments. Attorney Roger Yearwood, representing the Town Clerk, requested permission for the matter to be stood down so he could file an ex-parte application, a move which was challenged by NBS’s lawyer, Pauline Chase. According to Chase, she could not concede for the matter be stood down, since she had not seen nor was she served with a request for an ex-parte application by the respondents. Justice Reynolds then proposed the matter be inter-partes, which did not sit well with Yearwood. Chase then told the court the Attorney General is also a respondent in the matter, since there was no representation for the AG in the Court this morning. Yearwood then told the court he would hold for the Attorney General. Attorney Stephen Fraser then rose to indicate his representation of Smart City Solutions, which has expressed interest in the matter. Although this court matter is in progress, and another matter, brought by citizen Mahendra Arjune, is still pending against the parking meter regime, Georgetown Mayor Patricia Chase-Green said the project will commence operations as of today, February 20. Attorney Ronald Burch-Smith told Demerara Waves Online News outside the courtroom today that although the matter is not an injunction, there is an assumption state agencies would allow for a stay of execution in whatever operations is being challenged until the matter is over. “If they continue to implement, it would be a frightening development for public law in Guyana,” Burch-Smith, a lawyer closely associated with the Movement Against Parking Meters, said. At a recent town-hall meeting organised by MAPM, which the Mayor refused to attend, attorney Chase, also close to the MAPM, said, should the parking meter project continue, a Contempt of Court Order would be underway. On Avenue of the Republic, Smart City Solutions staff were seen with vehicle clamps.